contains both a subject and a predicate. can be a part of a multi-clause sentence. uses conjunctions such as – or, for, nor, so, yet, and, but. Example: We visited Agra, but we did not go to Taj Mahal. always be a part of a sentence, on which it depends for meaning. A dependent clause is of three types – Adjective Clause, Adverb Clause, and Noun Clause. An adjective clause or relative clause is like an adjective which comes before to change or modify the noun or pronoun by – who, which, that, where, when, whose, whom, whoever, etc. This is a resort that we saw on the TV. The Lady who was our tour guide is a American. An adverbial clause or subordinate clause is a type of dependent clause which starts with subordinating conjunctions like – because, although, when, if, until, as if etc. The homeless guy spent the night on the road. We wanted to go to the Bashundhara Cineplex. In a sentence when a clause functions as the complement, subject or object is called noun clause. It starts with the same words that begin adjective clauses, e.g., that, who, when, which, where, whether, why, how. What we saw at the Thor movie was amazing. 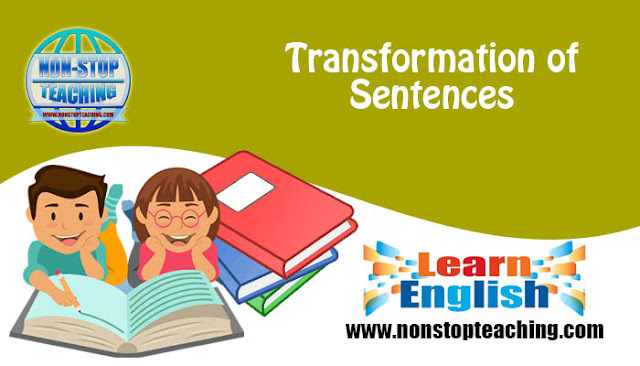 To understand the types of transformation of sentences we need to know the definition of the Simple Sentences, Complex Sentences, and Compound Sentences. When in a sentence that has one independent clause it is called simple sentence. Example: He confessed his illegal act. When in a sentence that has one clause and one or more subordinate clauses it is called a complex sentence. Example: He confessed that he was guilty of his illegal act. When in a sentence that has more than one main clause it is called the compound sentence. Example: I went to watch a movie named Justice League, but the movie was already houseful. Converting Simple Sentences into Complex Sentences can be done easily. And this can be done by simply expanding a word or a phrase into a clause. Moreover, we can do the same thing when we want to change the Complex Sentences into Simple Sentences. And this can be done by eliminating a clause into a word or a phrase. “Present participle” in a simple sentence, to convert into complex sentences by adding “since/as/when” at the first half of the sentence. Simple Sentence: Closing the door, I went back to school. Complex Sentence: When I closed the door, I went back to school. “Being/ Verb+ing” in a simple sentence, to convert into a complex sentence by adding “as/when/since” at the first half of the sentence. Simple Sentence: After winning a beauty contest she cried. Complex Sentence: As she won the beauty contest, she cried. “Too…to” in a simple sentence, to convert into a complex sentence by adding “so…that (negative)”. Simple Sentence: He is too weak to carry the box. Complex Sentence: He is so weak that he cannot carry the box. “To” in the simple sentence, to convert into a complex sentence by adding “so that” in the sentence. Simple sentence: We eat to live. Complex Sentence: We eat so that we can live. In the simple sentence “in spite of/ despite”, to convert into the complex sentence by adding “though/ although”in the sentence. Simple Sentence: In spite of being rich, she is hard working. Complex Sentence: Though she is rich, she is hard working. “Because of” in the simple sentence, to convert it to the complex sentence by adding “since” at the beginning of the sentence. Simple Sentence: Because of his illness, he could not join the meeting. Complex Sentence: Since he was ill, he could not join the meeting. “Subject + verb + object + present participle” type of simple sentence, to convert it to the complex sentence by “subject + verb + object + relative pronoun of the object + be verb according to relative pronoun and tense + rest of the sentence”. Simple Sentence: I saw a bird flying. Complex Sentence: I saw a bird which was flying. In the simple sentence starts with “without”, by adding “if/ in case” is converted into the complex sentence. Simple Sentence: Without adding the sugar the dish will taste bad. Complex Sentence: If you do not add sugar the dish will taste bad. In the simple sentence “at the time” will be converted into “when” in the complex sentence. Simple Sentence: She woke up at the time of load shedding. Complex Sentence: She woke up when it was load shedding. In the simple sentence, “adjective” will be converted into “that/which” in the complex sentence. Simple Sentence: It was a blue shirt. Complex Sentence: It was a shirt which was blue.